The national dialogue under the patronage of Minister of Social Development H.E. 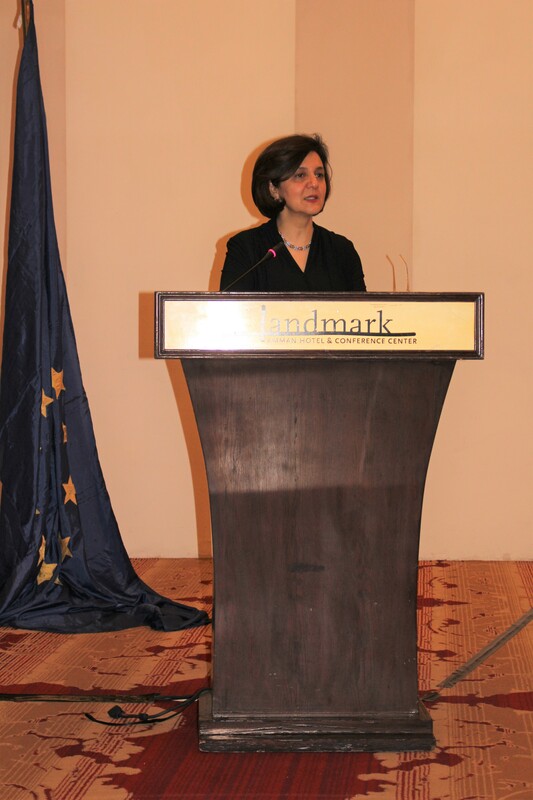 Hala Lattouf, and with the support of the European Union, took place on 7 – 8 May 2018 in Amman, Jordan. 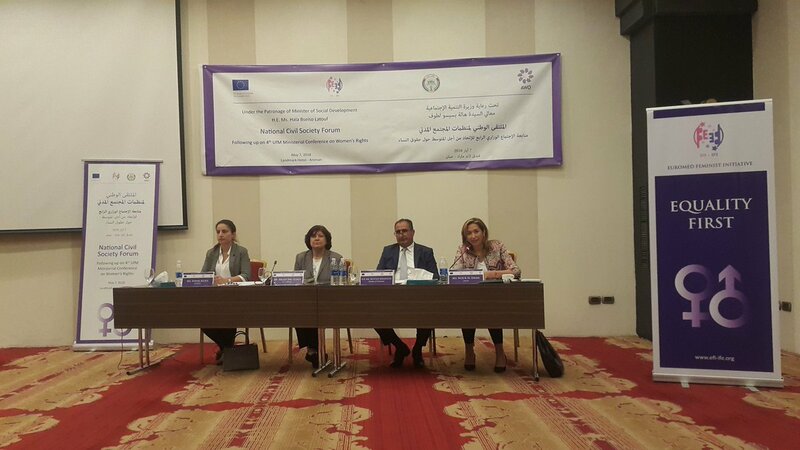 It was organised by Euromed Feminist Initiative (EFI) in partnership with the Arab Women Organization of Jordan (AWO) and the Ministry of Social Development (MoSD). Click here to view the photo album. The dialogue gathered representatives of concerned ministries: Ministry of Social Development, Ministry of Labour, Ministry of Youth, Ministry of Political and Parliamentary Affairs, Ministry of Education, Ministry of Planning and International Cooperation and representatives of women’s and human rights organizations, Municipalities, Local Councils as well as party leaders, lawyers, academics, gender experts and journalists. 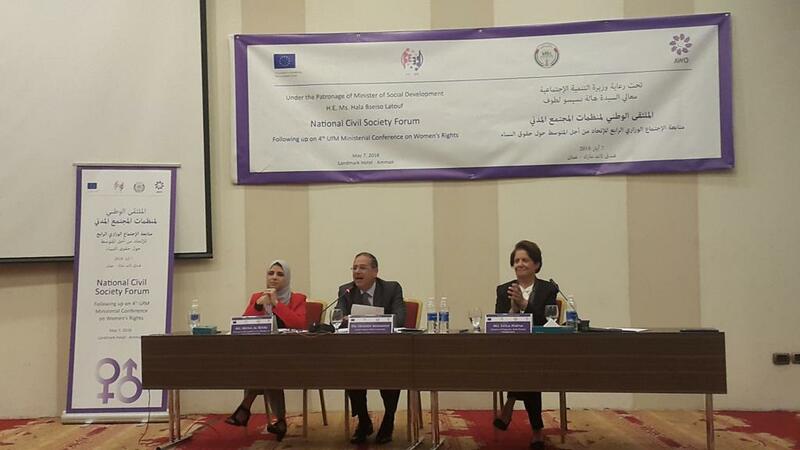 During the first day, CSOs and CBOs from Amman and governorates participated in a national forum at the Landmark hotel in Amman, in order to spread awareness and knowledge on the Ministerial Declaration from the 4th UfM ministerial meeting on women’s rights and the Declaration of the Civil Society Conference that Euromed Feminist Initiative organised with the support of the EU on November 2017 in Cairo. In the opening, H.E. Ms. Hala Bseiso Latouf, Minister of Social Development, expressed her gratitude and appreciation to the Euromed Feminist Initiative for its efforts in following up on the implementation of the UfM Ministerial process on strengthening the role of women in society and affirmed the strong partnership between the Ministry of Social Development and Euromed Feminist Initiative. She added that EFI and the Ministry of Social Development have been working together since 2015 to enhance gender equality policy making in the Euro-Med Region. During the first session “Follow up on the governmental commitments to implement gender equality Policy”, Ms. Muna Rfou, Director of Gender Unit, Ministry of Social Development and Ms. Laila Nafaa, Director of Programs, Arab Women Organization (AWO) presented the Ministerial and the civil society Declarations. During the following session, experts from the civil society, political parties and Parliament discussed mechanisms for the implementation of gender equality through the Ministerial Process with focus on economic participation. Mr. Mustafa Khasawneh, Member of Parliament, highlighted the work of the Jordanian Parliament and the important role of the Parliamentary Initiative Bloc in the implementation of gender equality in Jordan. Ms. Abla Abu Elbeh, Secretary General, The Jordanian People’s Democratic Party HASHD, emphasized the importance of women's involvement in workers and trade unions, and highlighted the importance of creating a friendly environment for women at work. Ms. Sahar Aloul, SADAQA executive board member, praised the latest decisions by the Lower House’s Labour Committee to amend provisions in the draft Labour Law that ensured equal wages, the presence of daycare centres at workplaces and the introduction of paternity leave. In the second day of the dialogue, selected representatives from CSOs and CBOs gathered with representatives of concerned ministries and relevant stakeholders in a national roundtable held at the Ministry of Social Development to discuss national follow up and monitoring mechanisms to implement the Cairo Ministerial commitments into concrete gender equality policies and actions. In her opening remarks, H.E. Ms. Hala Bseiso Latouf, Minister of Social Development, said that the four priorities areas of the Ministerial Declaration are among the priorities of the government and are consistent with its policies and programs. H.E. 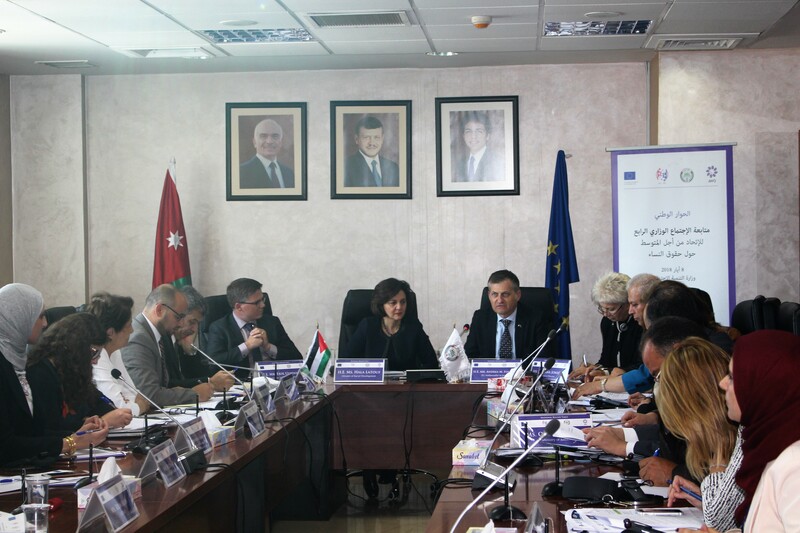 Mr. Andrea Fontana, EU Ambassador to Jordan said that the EU funded projects in Jordan support the gender equality agenda of the Ministry of Social Development in cooperation with civil society. He added that EU gender policy focuses on 3 priorities: ensuring women's physical and psychological integrity, promoting women’s social and economic empowerment and strengthening women's voice and participation. H.E. Mr. Erik Ulhenhag, Ambassador of Sweden to Jordan, shared analysis of the situation of women’s rights and gender equality in Sweden. He affirmed the importance of gender equality in which it is a basic condition for peace, security and sustainable development. He added that gender equality creates strong families and prosperous societies. Ms. Boriana Jonsson, Excutive director of EFI, praised the prominent and systematic cooperation between MoSD and EFI that is based on mutual respect and trust. She expressed her appreciation to the European Union for its prominent political international support and for supporting this process that allowed the civil society to discuss and to give the expertise and the analysis from the situation on the ground to the decision makers. In the first session “Follow up on the governmental commitments to implement gender equality Policy”, the Ministerial Declaration from the 4th UFM Conference on women’s rights and the Declaration of the Euro-Med Women’s Rights Civil Society Conference were presented by Dr. Ahmad Abu Haidar, Director of Policies and Strategies, MoSD and Ms. Laila Nafaa, Arab Women Organization. Dr. Ahmad Abu Haidar, explained the four priority areas of the Ministerial Declaration: raising women’s participation in public life and decision-making; improving women’s economic participation; combating all forms of violence against women and girls; and eliminating gender stereotypes. 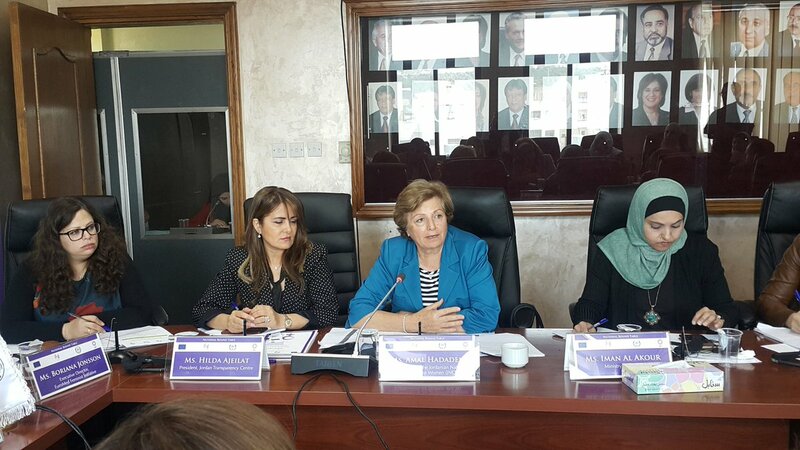 During the second session, Ms. Amal Haddadin, Legal Advisor, Jordanian National Commission for Women, Ms. Iman Akour, Ministry of Labour and Ms. Mais Afaneh, Regional Manager, EFI discussed mechanisms for the implementation of gender equality through the Ministerial Process with focus on economic participation and women’s access to labour market. 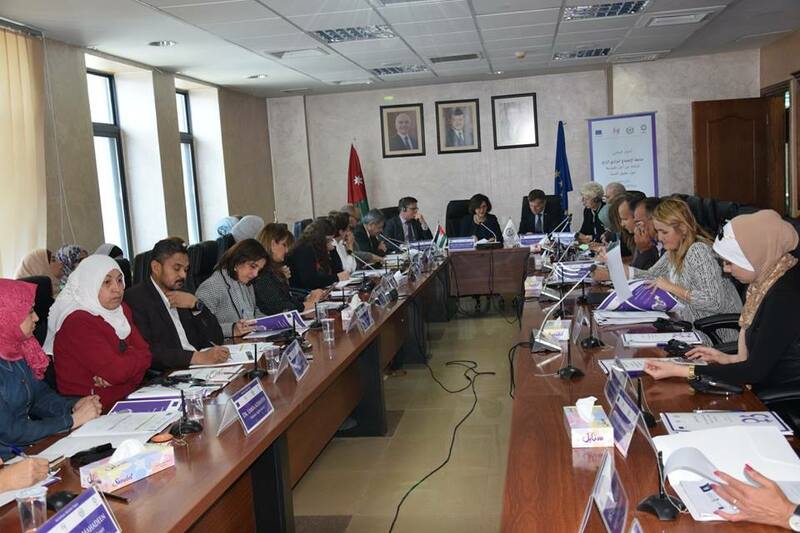 In the end, Participants and the representatives of relevant ministries and civil society organizations agreed to develop a national action plan on the Ministerial Declaration of the 4th UFM ministerial conference on improving women’s role in society. They also suggested to adopt a gender equality law and stressed the importance of having supportive systems that enhance women's participation in the labour market.